Special is valid from 22nd March 2019 to 30th April 2019. *Conditions Apply: Prices are per person, capacity controlled and listed in Australian dollars twin share including port taxes. Prices may fluctuate if surcharges, fees, taxes or currency change, and may be withdrawn at any time. Prices shown here are not shown in real time. While we endeavour to keep our pricing as up-to-date as possible, the advertised prices shown here may differ from the live prices in our booking system. The prices shown are for a cash payment. Credit card fees of up to 2.5% will apply. Offer correct as at 22Mar19 and subject to live availability at time of booking. Prices are per person twin share based on best available cruise fare, inclusive of all discounts unless otherwise stated. All offers are capacity controlled and can be withdrawn or modified at any time without notice and subject to availability at time of booking. Outside and Balcony cabins may have obstructed views and Suite cabins comprises Junior Suites, Mini Suites and any other type of suite that represents the best value for each cruise. Unless otherwise stated, all packages containing airfare will require full airfare and taxes within 24 hours of reservation and cancellation/amendment conditions apply. Air taxes are included in package price and are subject to change depending on departure city. Onboard gratuities are included and may not be removed from pricing. Cabins are based on guarantee and cabin number will not be assigned until documentation or embarkation. An ESTA visa is required for travel to the USA & Canada and is the responsibility of the passenger to obtain this before travel. All passports, vaccinations and visas are the responsibility of the travelling guest to secure prior to departure from Australia. Some cruise lines reserve the right to impose a fuel levy if the NMEX price reaches a certain level - please check with your consultant at time of booking. Cruise deposit, amendment and cancellation conditions apply. Travel agent service fees not included. Special conditions apply - please ask for full details at time of enquiry. Offer ends 30Apr19 or until sold out/withdrawn from sale. Please note only residents with an Australian address are eligible to book Australian rates in Australian dollars. This cruise package is provided by Seven Oceans Cruising, please ask your travel agent to contact us for more information. 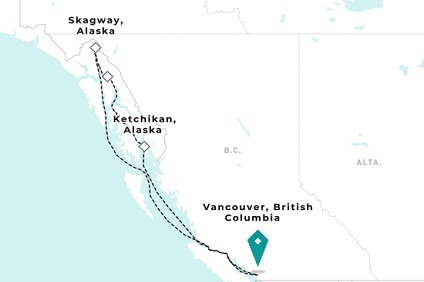 7 Night Cruise sailing from Vancouver roundtrip aboard Crystal Symphony. Trek the Mendenhall Glacier. Go flightseeing over Misty Fjords National Monument. Explore gold rush towns and kayak among the otters. Discover the vibrancy of this British Columbia cosmopolitan. Vancouver has eclectic neighbors to explore, exquisite seafood, and the largest natural park in North America. This Gold Rush city is not only the capital of Alaska, but an epicenter of Alaskan history, culture, music, and food. Here, enjoy endless attractions, activities, and unimaginable glaciers, only accessible by air or sea. Paddle a kayak on sheltered waters, take a floatplane to a remote mountain lake or try your hand at sportfishing in Ketchikan, salmon capital of the world and a paradise for fishermen and nature-lovers alike. A quiet city with rich Indian heritage, it hosts the world's largest collection of authentic totem poles at Totem Bight as well as a rustic boardwalk, quaint restaurants perched on stilts above the water, and scores of fascinating shops and spectacular views from every vantage point.